This pappardelle with amazing slow cooked meat from Jamie Oliver is essentially a braised beef ragu that can be made in the slow cooker. How To Select The Right Cut Of Beef? Sure, you could use venison or boar or squab or rabbit here, as Jamie Oliver suggests above. Although chances are you’re going to use beef. So when you find yourself standing at the butcher counter, wondering which cut is best, think cheap. Even the least expensive cut of beef will morph into something meltingly tender after a long, slow swim in wine and aromatics, whether on the stovetop or in the slow cooker. Any boneless cut will do quite nicely, although you especially can’t go wrong with anything labeled chuck or rump or roast. 1. To make the Pappardelle with Amazing Slow-Cooked Meat in your slow cooker, see the Slow Cooker Variation below. To make the Pappardelle with Amazing Slow-Cooked Meat on your stovetop, season the meat with salt and pepper. (It can be cut into large 2-inch chunks if it’s beef, venison, or wild boar; left whole if it’s squab (pigeon); or cut into 5 or 6 pieces if it’s rabbit.) Place a Dutch oven or other deep-sided pot over medium-high heat. Add a little olive oil and the meat, being careful not to crowd the pot, and cook until golden brown on all sides. It may be necessary to work in batches; if so, return all the meat to the pot after it’s browned. 2. Add your herbs, onions, garlic, carrot, and celery to the meat in the pot, reduce the heat, and continue to cook, stirring occasionally, until the vegetables have softened, about 5 minutes. Pour in your red wine and simmer just until the liquid has almost completely cooked away but has left you with a fantastic color and fragrance. 3. Add the plum tomatoes, the pearl barley, and just enough water to cover the meat by about 1/2 inch. Make yourself a cartouche of parchment or wax paper. (A “cartouche” is a piece of paper that’s used to slow down the loss of moisture in cooking. To form a cartouche, take a square piece of parchment or wax paper that’s slightly larger than your pot. Fold the square in half, and in half again. Keep folding the same way so that the tip becomes the center. When it’s pretty pointy, you’re ready to measure up. Hold the tip of the cartouche to the center of the pan, tear or cut off any paper that extends beyond the edge of the pan. Open out to a circle—the cartouche is ready. You can get away with the cartouche being a bit larger than the pan, so don’t worry if it’s not perfectly sized to fit.) Wet 1 side of the paper with a little water, rub it with a little olive oil, and place it on the surface of the meat and vegetable mixture in the pot, oil side down. Put a lid on the pot as well to retain as much moisture as possible while cooking. Cook over really low heat at a super gentle simmer for 2 to 3 hours. The exact timing will depend on the tenderness and type of meat. You’ll know that the meat is ready when you can literally tug on it with a fork and the meat easily pulls apart in strands so tender you go wobbly in the knees. 4. At this point, season the braised beef mixture with salt and pepper to taste and let it cool slightly before removing the meat from the pan. Using 2 forks, pull apart all the lovely pieces of meat, throwing away any gristle or chunks of undissolved fat. Skim any fat from the surface of the braising liquid. Return the shredded meat to the pot and place over low heat. 5. Bring a pot of salted water to a boil and cook your pappardelle for 3 minutes if using fresh pasta or according to the package instructions if using dried. Once it’s cooked, drain it in a colander, saving some of the cooking water. 6. Remove the pot of braised beef from the heat and stir in the butter and Parmesan along with a little of the reserved pasta cooking water—this will make it juicy and shiny. Toss the beef ragu with your drained pasta and, if desired, serve sprinkled with a little finely chopped fresh rosemary and some more grated Parmesan. Serve immediately. The term “amazing” still applies to this recipe when it’s made the lazy, er, harried cook’s way in the slow cooker. Perhaps even more so since it’s so ridiculously easy. Just toss everything in the slow cooker. No need to brown the meat or vegetables in a skillet first (although if you can spare the time to do so, you will be justly rewarded with a slightly more complex flavor). No need to add any water. By all means, omit the cartouche. And you may want to consider either swapping fresh herbs for dried or, if you prefer fresh, adding them only during the last hour or so of cooking. Cook on low for 8 or so hours, until the meat is fall-apart tender. If the sauce seems too liquidy, simply remove the meat, crank the slow cooker up to high, and simmer until the liquid is reduced to the desired consistency. Continue with step 4 in the instructions above. Pappardelle with Amazing Slow Cooked Meat Recipe © 2003 Jamie Oliver. 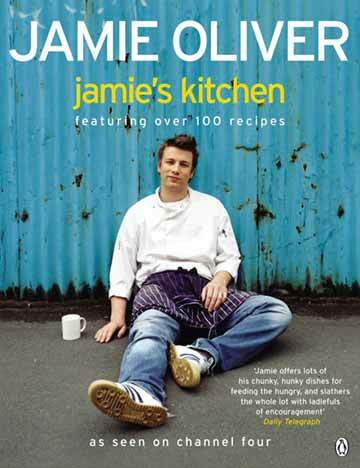 Photo © 2002 Jamie Oliver. All rights reserved. All recipes and photos used with permission of the publisher.